Last week I met with many of our wonderful friends–for lunch, coffee, a chick flick, and Thanksgiving dinner. Have I mentioned how fortunate I am to have met so many wonderful American and Argentine friends? The pictured dessert spread was the finale of our Thanksgiving night. A generous fellow invited a group of friends for a catered meal with all of the traditional plates–stuffing, sweet potatoes, bread, asparagus with almonds, buns, and cole slaw. The chef even made E. and I vegetarian cutlets with herb butter. By the time I finished my plate full of my old favorites, I could not think of eating dessert. I only had room for a small piece of chocolate cake. 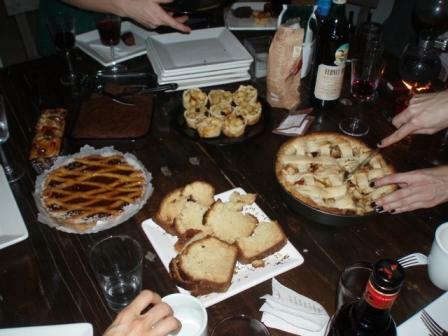 Above you can see membrillo (quince) pie, apple pie, dried fruit bread, and olive oil bread. All this was topped with freshly brewed coffee and a mate passed around the table. I am thankful for all of my new and old friends and this opportunity to live abroad. And, always, I am thankful for our supportive families who I deeply miss. Part of the reason I am compelled to see as many friends as possible this month is that we are leaving Buenos Aires to move to Santiago de Chile at the end of December. I will be Still Life in Santiago for at least a month. It is time to see a new place since telecommuting affords us some flexibility with living arrangements. We’ll take a bus from Buenos Aires to Mendoza, and then bus from Mendoza to Santiago. I have heard that the view over the Andes will be spectacular. After a couple of days in Santiago, E. and I will fly to Punta Arenas in southern Chile–Patagonia. We’ll see penguin colonies and then trek in a several day hike called the “W” in Parque Torres del Paine. After a week down south, we’ll live and work in Santiago in a neighborhood called Bellas Artes.